This is a fairly easy game to get neopoints from and it even has a bunch of cheats that make it even easier. In the game, you play as a Yurble farmer that is fed up with Slorgs that are always eating his crops and food. So he takes matters into his own hands and invents the Slorgerizer X4. A gun that shoots out balls of Slorg-B-Gone to repel the slorgs and keep them away. The controls for this game are pretty simple. Use the left and right arrow keys to move the Slorgerizer, well, left and right and the spacebar to shoot a ball of Slorg-B-Gone at the Slorgs. In order to repel the Slorgs, you need to get them in groups of three or more and hit them with a ball of Slorg-B-Gone that is the same colour as the Slorgs. If you don't make a group of three, your ball of Slorg-B-Gone will turn into a Slorg of the same colour. All in all, its a very simple game. 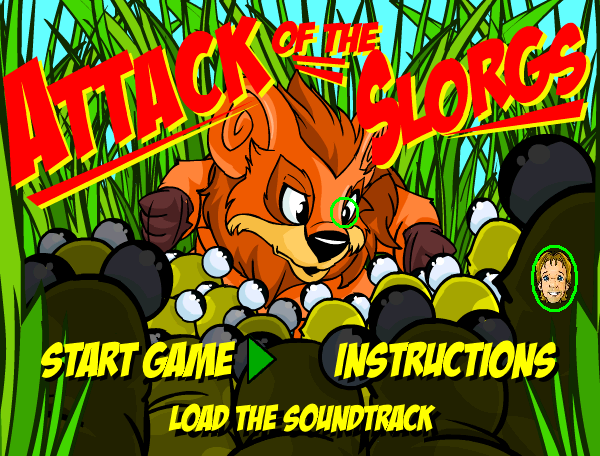 There are 18 different levels in Attack of the Slorgs. For each new level, you need repel a certain number of Slorgs in order to get to the next level. The paths that the Slorgs take are also different between levels, but in an easy pattern. There are only six different paths and they occur in order. For example, on level one, the Slorgs go along path one, on level two Slorgs go along path two etc. Once you get to level seven, the patter just starts over. Level seven, the Slorgs go along path one, level eight, the Slorgs go along path two etc. Got it now? Good. 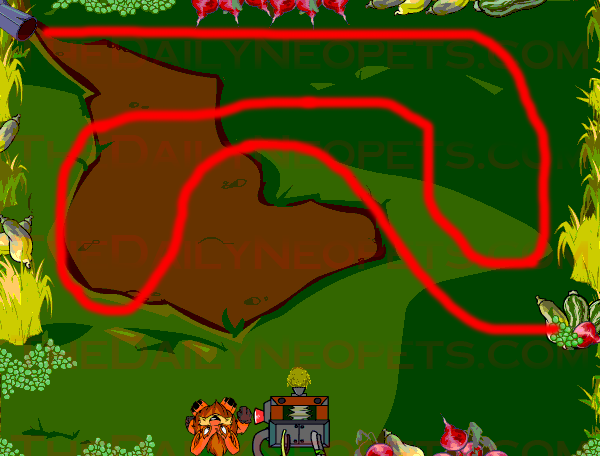 Just click on the image links to see the paths that the Slorgs take. There are six different colours of Slorgs in this game to make it a bit harder. Only three appear in the first few levels with the other three colours being introduced gradually as you play the game. All the new ones will start coming out of the pipe and your Slorgerizer in the levels that they appear (see below) Except for the Gray Slorg. It will come out of the Slorgerizer, but not the pipe at the top of your screen. It may not seem so, but this makes the game significantly harder. There are also six different powerups that you can get in the game. They are each represented by a colour and the balls look the same in the Slorgerizer except they glow slightly. Most of the powerups are good except for one. Refer to the table below for all the powerup info. 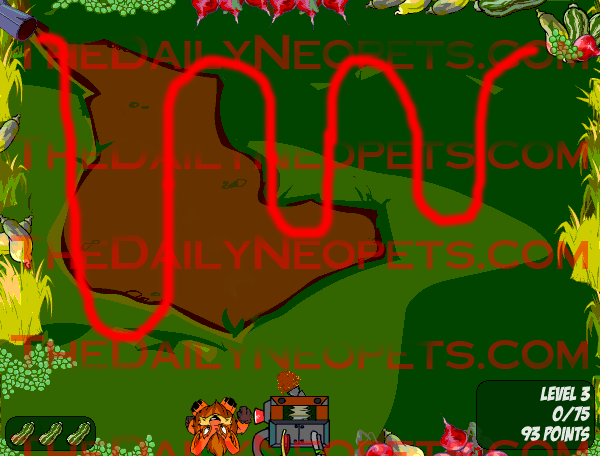 Note that the powerups only take effect if you hit the path of Slorgs. Blocks all the Slorgs that are behind where you shoot the powerup. Slows down all the Slorgs. Destroys 2 extra Slorgs on either side of where the Slorg-B-Gone hits. RARE! Turns all the Slorgs on the screen into one random colour. This powerup is bad! It will add around 10 more Slorgs wherever it hits. It's best to shoot this powerup into an empty space and not into your Slorg line. Destroys all Slorgs behind where it hits. There are a lot of different secrets and fun things in this game. They are all outlined below. Every once in a while you'll see a little frog's head pop up in the top left hand corner of your screen, right below the pipe that the Slorgs come out of. If you see him there, shoot him! You get an extra 25 points every time you hit him, but be fast, he's only there for a few seconds. A strategy for the Mysterious Frog is to quickly pause or slow down the Slorg line with a power-up to get a clear shot of the frog. Once you are in the clear, began spamming him with many shots before he dissapears. This strategy can rack up points efficiently. Also, if you are ever waiting for the Slorgs to go farther or anything, always keep your mouse pointed at that spot. Just in case he shows up. This usually doesn't happen in the early levels, but happens increasingly more as you progress through the game. All that happens is your laser starts to flicker and then dissapears all together. But wait! There is a way to stop this. As soon as you see your laser start to flicker type in chargex4. This will put your laser back to normal. You can also type this after your laser dissapears. This is luckily the rarest thing that will happen to you in the game. The effect is very simple, yet very annoying and makes the game much harder. All it does is reverse your left and right arrow keys. In other words, if you press left, the Slorgerizer goes right and if you press right, the Slorgerizer goes left. Annoying! Yep, that's right, Oscar made this game. In order to see his head all you need to do is click the pupil in the Yurble's right eye. There are two codes that you can put in to help you beat the game. They are outlined below. Note that you can't hit any other buttons while typing in the codes. This includes the arrow buttons, so type as fast as you can and be careful not to press Q or you'll quit the game with no confirmation screens. That's bad. Anyways, here are the codes. marrow - Type in this code to get yourself an extra life. This will work anytime in the game, but only once per window. This means that if you use this code, next time you play, you have to close the game window and open a new one in order to use the code again. chargex4 - type in this code when your laser is failing or after it had failed to bring it back to full strength. This can be used infinite times and is very helpful when you're going after that trophy. All in all, this game is great for getting neopoints and a new avatar from, but quite hard to get the trophy, but if you keep trying and practice, practice, practice you could have it in no time! The Snowager is awake. He'll be sleeping in 2 hours, 17 minutes.